Paying for college can seem like an overwhelming and confusing task, especially for parents going through the college application process for the first time. What if a student could find the perfect college AND save money on expenses? The first step towards a student's college success is to start planning NOW. Planning for college can be done as early as freshman year in high school, and this is an ideal time to start exploring different options. Most students wait until the end of their junior year to start researching colleges, and by then they may be missing out on helpful financial opportunities. Additionally, navigating through the college process can be a stressful, expensive experience. Missing a deadline or not knowing about a potentially perfect college can be both costly and detrimental to a student. 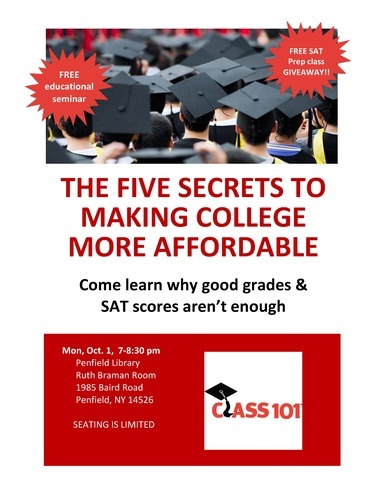 Join Tim Shanahan of Class 101 College Planning to learn about the five ways to lower the cost of college for you and your student. Topics covered include choosing (and gaining admission to) the right college, navigating financial aid and scholarships, completing the FAFSA (Financial Aid Application), and making the most of your student's accomplishments. Tim Shanahan is the owner of Class 101 College Planning in Penfield and Victor, NY. Tim discovered his passion for college planning when he began assisting the oldest of his three sons explore his college future. After hundreds of hours of research and dozens of college visits, Tim realized that he loved the entire process of helping others pursue their college dreams. He continued the same process with his younger sons, helping all three obtain full tuition scholarships (and one child a full cost of attendance scholarship worth more than $260,000) to three different colleges. 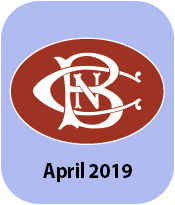 The Penfield Business Chamber is partnering with the Penfield Public Library for a series of programs dedicated to providing community members with information about a wide variety of personal finance-related topics. Do you have an idea for our Community Series? Email us at info@penfieldbusiness.org. This event is free but registration is helpful for planning purposes.